The police say Wednesday’s mass shooting, which killed 17 and injured 14 at a Florida high school, involved an AR-15 semiautomatic rifle. The same type of gun has been used in the deadliest shootings in modern US history. The suspect in Florida, who legally bought the AR-15 authorities say was used in the attack, reportedly was once barred from carrying a backpack to his own high school for disciplinary reasons. The shooting at Marjory Stoneman Douglas High School in South Florida on Wednesday, which left at least 17 people dead and 14 injured, seems to share a common thread with the deadliest mass shootings in modern US history: the AR-15 rifle. When Adam Lanza killed 20 children, six teachers, his mother, and himself in Newtown, Connecticut, in 2012, he used an AR-15. When Omar Mateen killed 49 people and injured 50 others shooting up the Pulse nightclub in Orlando, Florida, in 2016, he had a version of an AR-15 among his arsenal. When Stephen Paddock opened fire from the 32nd story of the Mandalay Bay Resort and Casino on a crowd at a music festival in October, he had AR-15s among his many guns. The next month, when Devin Kelley killed 26 people in a church in Sutherland Springs, Texas, he had an AR-15-style Ruger on him. Now Nikolas Cruz, the 19-year-old accused of attacking Marjory Stoneman Douglas, the high school he was expelled from, seems to have joined the ranks of the deadliest killers in US history by virtue of the weapon used. The AR-15, the civilian, semiautomatic version of the military’s M16, has been around for decades. In Florida, a minor can buy or possess a rifle like the AR-15 with a parent or guardian’s consent. Business Insider reviewed Florida’s gun laws and found no lower age limit for those who can possess guns with their parent or guardian’s consent. “The AR-15 has soared in popularity amongst gun owners, due to a wide-range of factors. It is customisable, adaptable, reliable and accurate that can be used in sport shooting, hunting and self-defence situations. In the case of Paddock, the deadliest mass shooter in modern US history, his personal taste involved a “bump stock,” a device that allowed him to circumvent laws against automatic weapons by increasing the rate of fire of his semiautomatic rifles. But even without a bump stock, an AR-15 fires as quickly as its operator can pull the trigger. The NRA is right in that the AR-15, which costs a few hundred dollars, is nearly infinitely customisable. With shorter barrels and stocks, it can be made small enough to conceal on one’s person. 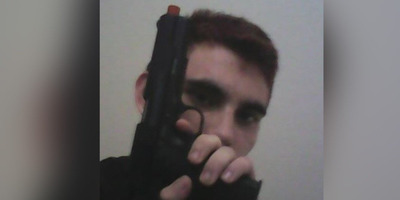 Instagram/cruz.nikolausAn Instagram post appearing to show Nikolas Cruz, the suspect in Wednesday’s attack, posing with a toy gun. Cruz’s lawyer told the Fort Lauderdale Sun Sentinel that Cruz legally possessed the AR-15 authorities said was used in Wednesday’s shooting. That was the case even though the high school last year apparently barred him from entering the campus with a backpack. Florida wouldn’t have required fingerprints, a special permit, or even a waiting period before Cruz bought his gun. A background check using demographic data would screen him for felony arrests, active warrants, immigration status, past convictions, and whether he had been declared mentally defective or involuntarily committed to an institution by a judge.